“War for the Planet of the Apes” is a satisfying conclusion to a trilogy that has brought much in terms of tackling humanity’s strengths, weaknesses and a mix of everything in between. While this finally concludes Caesar’s arc, there's no denying that the film capably opens the floodgates for a whole set of films in the series and where definitely happy about that fact. 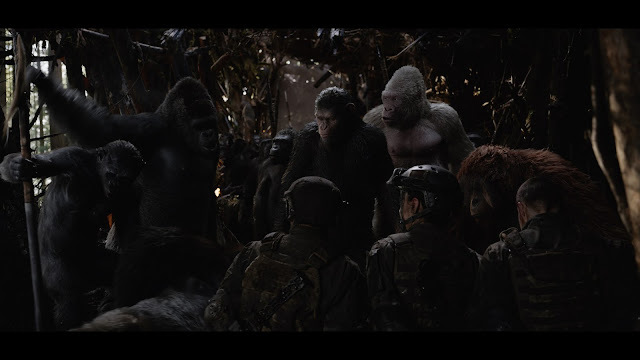 Reeling from the effects of Koba's action from the previous film, Caesar (Andy Serkis) and his apes are in hiding in the North Woods to prevent the continuation of a bloody war against humans. But when a rogue group of men led by a violent and crazy leader called the Colonel (Woody Harrelson) finds out about there hidden whereabouts and kills Caesar's loved ones, Caesar is forced into battle leading his most trusted apes against the Colonel. Let’s get this out of the way. “War for the Planet of the Apes” is still a visual and technical marvel. Same as it's brethrens before, the film blurs the line between reality and visual effects. That's to be expected but it doesn't get old. It is one of the key factors why this film works. The believability of the apes just adds so much more into the immersion and you'd be hard pressed to find instances where something looks fake. The narrative is also one of the film's strongest points. The feel is a mix of Western and a revenge film which had us reminiscing of “True Grit” or even “The Revenant”. Surprisingly, “War for the Planet of the Apes” was able to keep toe to toe with these two great films. We loved how the film turns the table as Caesar, like Koba before him, struggles to separate his anger towards the Colonel and in time proves to be a deadly and hasty decision not only for him but for his kind. Speaking of the Colonel, he is a complicated person and Woody Harrelson was fit for the role. And the conclusion between his grievances with Caesar while unconventional is moving to say the least. The film runtime is around 2 hours and it shows. Patches of it may seem slow for some viewers.